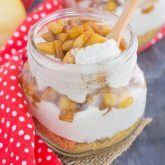 Loaded with creamy, vanilla ice cream, apple chunks, salted caramel sauce, and cinnamon graham crackers, this Caramel Apple Pie Milkshake will remind you of your favorite dessert, in shake form! I could eat ice cream any time of the year. Winter, spring, summer, or fall, those frozen treats always seem to be calling my name. And when fall comes around, those season flavors lure me into indulging in some ice cream deliciousness. I love the apple and pumpkin pie flavors and always wish those stuck around throughout the year. So when the hubster and I were contemplating making an ice cream run last weekend, I decided to whip out my blender and make a fall treat of my own. 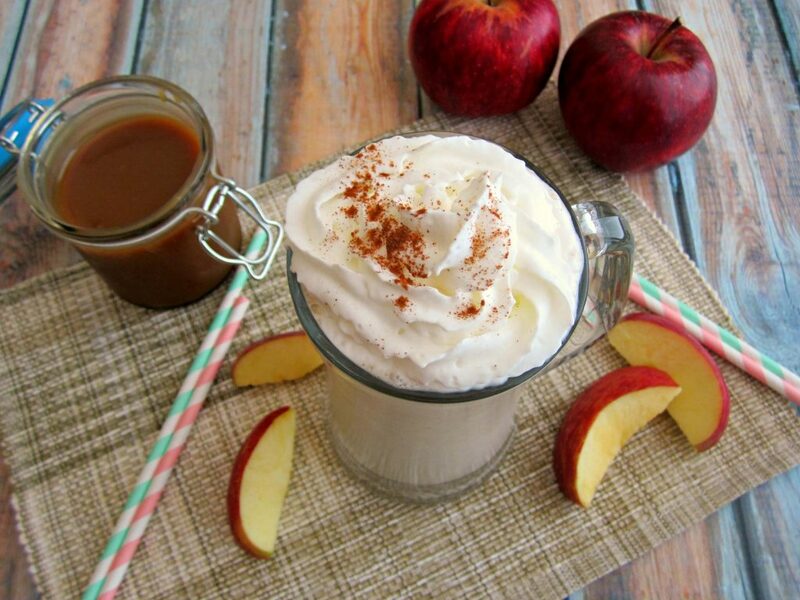 Say hello to this Caramel Apple Pie Milkshake! Loaded with creamy, vanilla ice cream, apple chunks, salted caramel sauce, and cinnamon graham crackers, this Caramel Apple Pie Milkshake will remind you of your favorite dessert, in shake form! Easy to make and even better to drink, this milkshake will have you making this seasonal favorite all year long. You’re just a few simple ingredients away from indulging in this creamy treat. 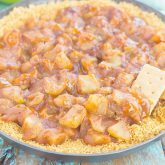 To make this milkshake a true pie flavor, I loaded it with diced apples, my home-made Salted Caramel Sauce, and cinnamon graham crackers. Throw everything into the blender and mix away. This Caramel Apple Pie Milkshake turns out thick, creamy, and bursting with apple and cinnamon flavor. One sip and I was hooked! The rich fudge and cinnamon graham crackers blended together to create a taste that is out-of-this-world good. Add in some apples and cinnamon, and it’s filled with fall flavors. This is one shake that I won’t be visiting a store or ice cream shop for! So what are you waiting for? This Caramel Apple Pie Milkshake is just waiting to be your new favorite fall ice cream! Looking for more milkshake recipes? I’ve got you covered! In the canister of a blender, combine the ice cream, apple, milk,cinnamon, caramel sauce, and graham crackers. Top with a sprinkle of cinnamon and whipped cream, if desired. I also like ice cream anytime of year! This milkshake looks really great! I love the seasonal flavors. Seasonal flavors are definitely the best! Thanks so much for the kind words! Gayle, what are you doing to me with this caramel apple pie milkshake, with your permission, can I eat a slice of pie with it.......for breakfast? Please?!? Oh well, drooling over this one. Ice cream is wonderful year round....agreed!!!! We have a wood burning stove and enjoy milkshakes and traditionally "cold" items because it does get so warm and cozy in our house. Sometimes we wear shorts when it's zero degrees outside because it's 80 in here!!!! Caramel and apple pie = best combo ever Gayle!!!!!! I would love to have a wood burning stove in my house! That must be so nice, Laura. Sounds like this shake would be perfect to cool you down inside your house! Thanks so much for the compliments! Oh my gosh....just hand me a large glass of this gorgeous milkshake with a side of your awesome salted caramel sauce and I'm set. For life. For real, this looks absolutely amazing, Gayle! Salted caramel sauce definitely makes everything better, especially in this milkshake! Thanks so much, Sarah! YES! This is awesome, Gayle! I love the idea. Especially because, like you, I love ice cream all year round. I'm the only customer at Ben and Jerry's in January! Seriously a very creative brainwave! I love going to ice cream places in the winter because no one is hardly ever there! Thanks so much for the shake love, Mir! I'm totally with you. I can eat ice cream all winter and chowder all summer. lol. And I LOVE caramel and apples any time of year! I totally eat soup in the summer, too...so delicious! This milkshake combines the best fall flavors. Thanks, Ashley! That's totally me too, Michele! I am always freezing, but ice cream is worth it. Thanks so much for the milkshake love! Now that's what I'm talking about! You don't need a season for milkshakes and ice cream. This shake includes all of my favorite flavors; apples and caramel. Total YUM! Thanks, Jen! I agree, no season is needed to eat ice cream. It's definitely good all year round, especially with a shake like this! Oh my goodness!! I need this!! haha... I love love LOVE seasonal foods!! What a fun recipe!! :) Perf for a fall afternoon! Thanks, Cailee! This would definitely make a great fall snack or dessert! I like your thinking, Allison! 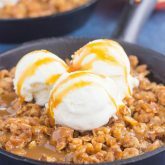 Apple pie and ice cream are just meant to be, and topped with some caramel is a match made in heaven! This looks very delicious and just in time for my apple obsession :) Never had apple spice milkshake before, but this one is worth trying! Pinning to my apple recipe board! I think you would love this milkshake, Mira! So full of apple flavor. Thanks so much for the sweet comment and pin! Oh yes: ice cream ALL YEAR LONG. No season for that. Your milkshake looks amazing! Thanks, Liz! I'm definitely going to make this milkshake year round, it's just too good not to! This looks so good. I love that you added graham crackers, what a great idea. And I agree, ice cream is definitely a treat that's grew all year! Thanks for the kind words, Stacey! The graham crackers give this shake a nice texture and flavor, which I love! Thanks, Mary Frances! You are definitely right, it combines summer and fall into one. Love it! Oh this just sounds too good! I actually love caramel apple pies. Nothing like a little bit of salty/sweet caramel cooked right in. Delicious! Can't wait to try this in milk shake form. Caramel apple pies are my favorite, too! Actually, anything with caramel is right up my alley! :) I hope you like this shake if you try it! Thanks so much for the kind words and pin, Manali! I love baking with apples and can't wait to reveal more of my recipes! I'll eat ice cream any time of year too -- I don't care if it's cold out, I always have room for ice cream. :) This milkshake flavor sounds incredible -- I love caramel apple anything! Same with me, Marcie! And that goes hand-in-hand with soup, too...I'll eat it when it's 90 degrees out! :) Thanks so much for the kind words! Your milkshake recipes are my favorites :) This looks amazing! Thanks, Medha! This flavor turned out fantastic, I think you would love it! I'm glad you feel the same way, Katie! I couldn't imagine not eating ice cream in the winter! :) Thanks so much for the milkshake love! This milkshake would last all of 10 seconds around me! 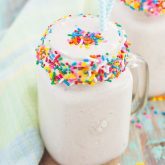 I love the combinations of ingredients in this, plus it's still hot outside so milkshakes are perfect :) Pinned! It didn't last long in my house either, especially with my ice cream addict of a husband! :) Thanks so much for the pin, Danielle! I need to make more milkshakes, this recipe confirms that! Ha ha definitely! More milkshakes are never a bad thing! I'm with you. I can eat ice cream any time as well. even when I'm cold, I'll just have some tea or coffee after to warm me back up. Love this milkshake. I bet my baby girl will love it too. Looks amazing, Gayle! Love simple, easy desserts like this, and that you can get your caramel apple fix with just a few minutes worth of work! Thanks, Denise! I love recipes like this too, so easy and practically fail-proof! This milkshake looks amaazinnggg Gayle!! Caramel Apple Pie? What a winning flavour combo!! Can't wait to try this next time an ice cream craving hits:) "I could eat ice cream any time of the year" <-- my thoughts exactly!! WOW! Very nice flavors! Festive! Awesome time of year food ideas! Great photos, too! YUM! I thought this shake would be perfect to combine the flavors of fall! Thanks so much for the kind words and for stopping by! This sounds delicious and perfect for fall! Woah. This is what my dreams are made of. Caramel + apples + milkshakes?!?! Yes please!! Ha ha my dreams, too! It's so perfect for when an ice cream craving strikes! This looks soooo good. 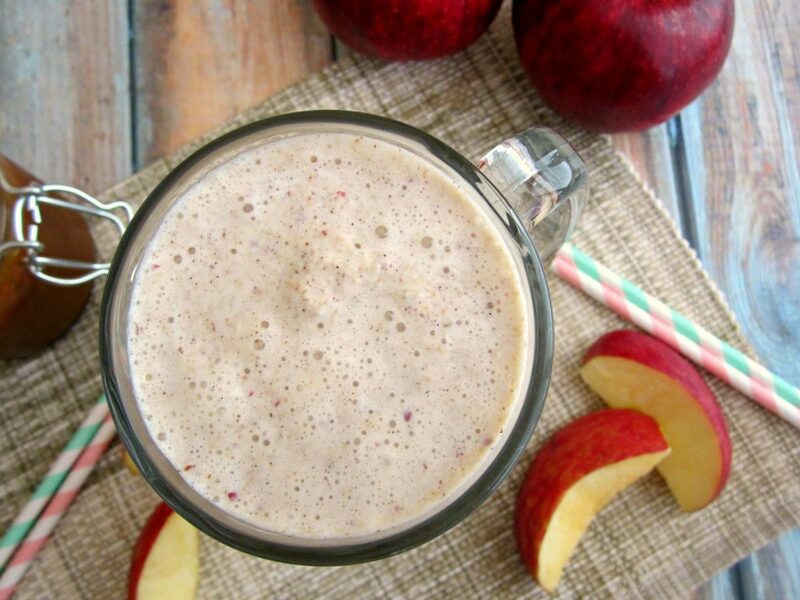 I love the idea of an apple pie in a milkshake! It's such a great fall milkshake! Thanks so much for the kind words and for stopping by, Karishma! We have not made milkshakes in the LONGEST time! I was just talking about it the other day to the hubs! This looks sooooo good. Geez does anyone really think ice cream is seasonal? Too bad for them. Ha. I could make a meal of a shake like this. Thick is the word that caught me after the flavor combo. Great idea. I love thick shakes, too! The thicker the better, especially when you have to eat it with a spoon. Thanks, Carol! Caramel milkshakes are my favourite kind but this truly takes it to the next level! Amazing! Thanks, Jessica! The apple flavor pairs so well with the caramel! Ice cream really is good any time of the year! I think you would love this milkshake, Izzy! So full of apple flavor! Gayle, I came to a conclusion while reading this - I think you should open your own ice cream/shake shop! I'm with you on the ice cream. . meant for year-round!! 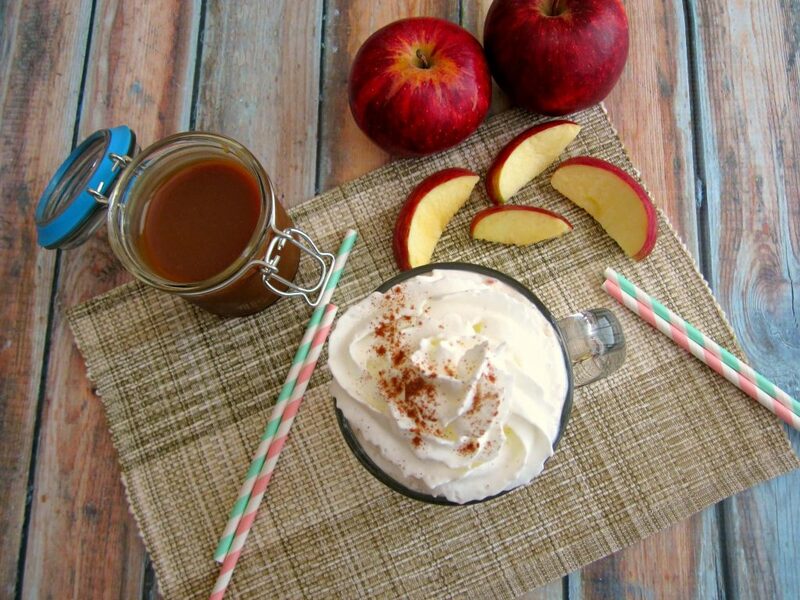 LOVE this Caramel Apple Pie Milkshake. . like the epitome of fall. . perfection in a milkshake. Love this and pinned!! Ice cream is definitely the best year round! Thanks so much for the pin and kind words, Alice! I totally agree - ice cream should be eaten all year long!! 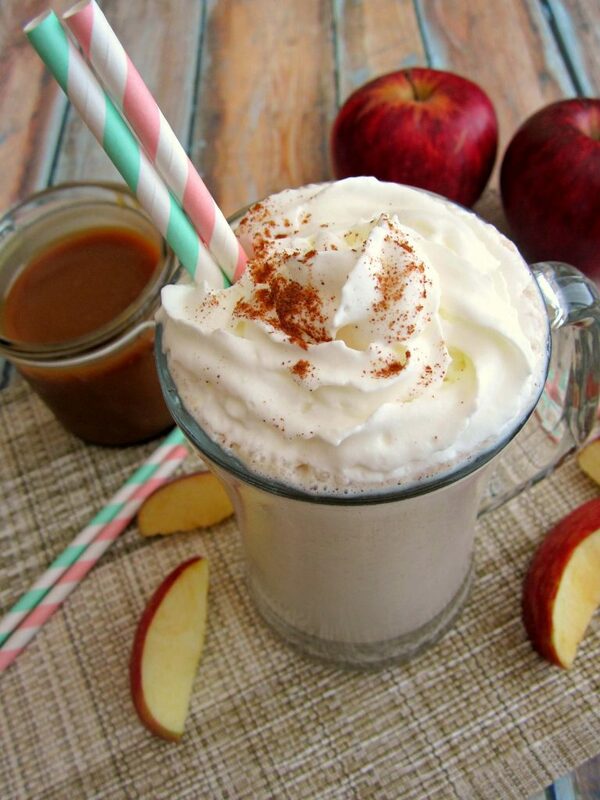 And what a great way to make a caramel apple pie milkshake!! YUM! Thanks, Chelsea! It was so much fun taste testing this flavor! Need this now! I'm going to just go ahead and make two because there's no way I could stop after one! Ha ha definitely, Leah! More ice cream is always better! Oh so delicious! I have no idea what I'm waiting for. I need to make this now! Pinned. :) Have a wonderful day!